The VC units are designed and built for severe clutch and brake applications where large-inertia loads are required. The VC is ideal for severe, high-torque applications. 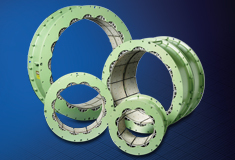 The ELASTA-FLEX™ VC brake serves as a durable, high-thermal- capacity drum clutch or brake. The unique design of the ventilated friction-shoe assembly allows for a high volume of air flow across the entire shoe length, enhancing heat dissipation, preserving the elastomeric actuator tube and extending overall clutch life. Virtually all components used in the VC design are replaceable.